The Temple Old-Fashioned Ice Cream Soda. Today's version of the old-fashioned Classic. Flavored syrup of your choice...sparkling water from our soda fountain, mixed with ice cream...three scoops of your favorite flavor Sherman's. Just like they used to be. 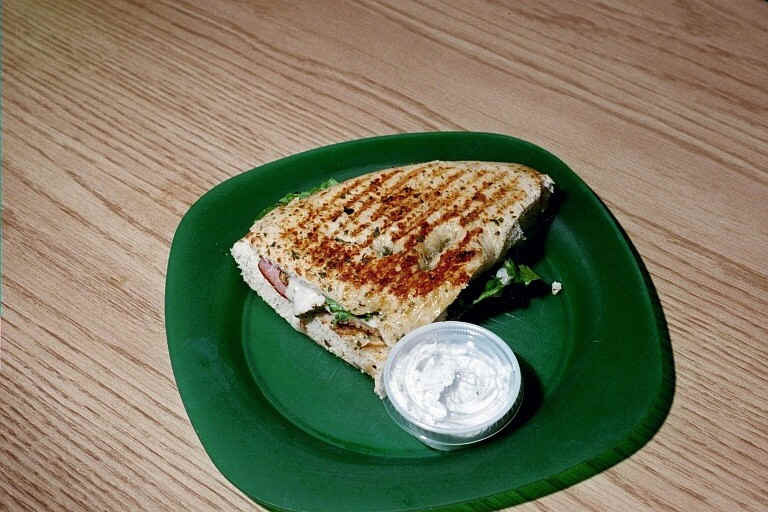 OUR NEW PANINI Grilled Italian-style Sandwich for lunch. Several variations but one of our popular "models" is with focaccia bread, Italian-style turkey, ham, roma tomatoes, grilled zucchini, onions & portabella mushrooms, roasted red peppers, Provolone, Havarti, Mozzarella and Parmesan cheeses, all grilled to perfection and served with our special sauce. Easy to make into a vegetarian's delight too. Check these out. Nowhere but Temple. Whatever Temple Specialty you choose, you'll be treated to the finest products and expert preparation.ICE CREAM SODAS...the old-fashioned way, hand mixed until smooth with 3 scoops of Sherman's Finest ice cream. THE TEMPLE BRAVO, SAMOAN SMOOTHIE or THE CURIOUS GEORGE...drinks to fit any taste. A STEAMER...all the warmth of a mocha without caffeine. Gourmet hot COCOAS and TEAS. The ITALIAN SODA, CHERRY PEPSI or GREEN RIVER. All the same way. Great products and careful preparation. The old-fashioned way at Temple. Like having your own little Lava Lamp! At Temple, you don't just get a flavored cappuccino, latte or mocha, you get a work of art. Your selection is served in a glass mug with each flavor in its own distinct layer, swaying to the rhythm of the world.